How about some seriously easy low carb taco shells for your Friday ? 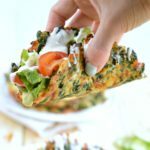 Those spinach low carb taco shells are one of my best low carb bread recipe on the blog, scroll down and I tell you more. SO first I will reassure there is NO need to be a chef to make this recipe! It is basically a NO FAIL recipe. All you need is 5 ingredients and well drained cooked spinach. Yes, that is maybe the only tricky part of this recipe the spinach has to be super dry. It is actually very easy. Whatever you are using fresh or frozen spinach all you need to do is pressing the cooked spinach between absorbent paper until no more water left. WATCH THE RECIPE VIDEO AND MAKE THE SPINACH TACO SHELLS NOW ! Honestly, the first time I tried this recipe I was not really sure it will hold together. BUT it actually did work pretty well! You can easily fill them fold them and add any sauce without a leak! It works perfectly like any soft taco recipe except this one is SUPER healthy. Plus, Emma – my 3 years old – absolutely love them SO if you are kiddo are picky eaters give it a try I am sure they will love it too. Personally, I filled my taco only with vegetables because it is summer and I am way TOO hot. So I added homemade guacamole – you can find my dairy free guacamole recipe here– shredded lettuce, tomatoes and cucumber slices and drizzle of cashew Aioli on top to add some creamy garlic taste. YEP! I also made the Aioli myself – you know I am a crazy clean eating cook! For the Aioli I did not follow a special recipe. I simply used 1 cup of cashew nuts that I soaked in water for 3 hours. Blend the soaked cashew with salt, pepper and 1-2 gloves o garlic until creamy and smooth and add 2 tbsp. of tahini paste and 2 tbsp. coconut milk to the mixture to make the sauce a bit thicker. But NOW you probably want to ask me if you can make-ahead this recipe! Absolutely! and you know what ? you can even eat those spinach taco cold. Usually this is how I organised myself. I simply prepare the batter few hours before dinner time, wrap my bowl with plastic wrap and store in the fridge. Then few hours before dinner, preheat oven to 200C (400F), arrange the taco batter on a baking tray covered with parchment paper and bake 15 minutes.You will get 4 soft low carb taco shells. If you bake them ahead, simply rewarm them 15 seconds in the microwave before filling them or eat them cold it is good too! I hope you enjoy this spinach taco recipe because it is probably my favorite recipe on the blog and maybe the most creative! And LOOK! I even made a quick video of me making those spinach soft taco recipe just to show you how EASY + TASTY+ HEALTHY this recipe is !!! And you know I love to know you more so tell me, what is your veggie obsession? the one you CAN’T live without ??? 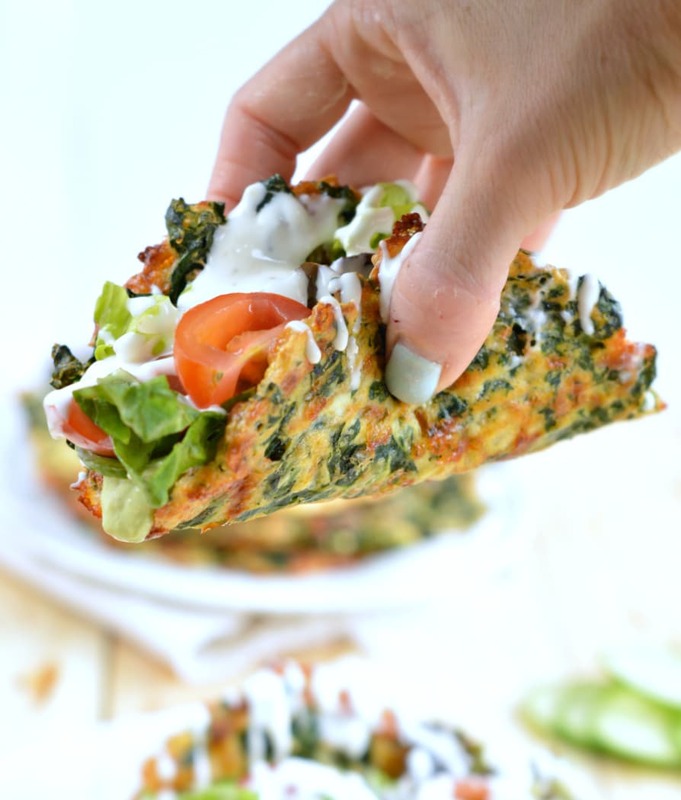 Soft Low carb spinach taco shells makes a delicious replacement to regular tacos. Preheat oven to 390 F (200 C). Place the fresh spinach leaves into a large mixing bowl. Cover the spinach leaves with 4 cups of boiling water. Cover. Set aside 2 minutes. In another bowl add ice cubes, about 1 cup. Using tongs remove the cooked spinach leaves from the mixing bowl and place them into the bowl filled with ice cubes. Stir the leaves into the ice cubes for few seconds to cool down. Pat dry the spinach between layers of absorbent paper to ensure that the cooked spinach are fully dry. Finely chopped the cooked spinach on a chopping board. Place them into a large mixing bowl and combine with grated cheese, eggs and almond meal, garlic powder and salt until it forms a sort of batter. Scoop out the batter onto a baking tray covered with parchment paper. I recommend to spray some olive oil on the parchment paper too to avoid the shells to stick to the paper ! I used a mechanical ice cream scoop maker to scoop out the batter into 4 equal amount of taco shell batter. Use your fingers to flatten each scoop of taco batter into a evenly flat thin circle that looks like a taco. Bake at 390 F (200 C) for 15 minutes or until it is golden and crispy on sides. Depending on oven and thickness of your tacos you may have to reduce to 350 F (180C). Simply watch the color and texture while baking to avoid burning. It is baked when the border are crispy and slighty golden brown. Cool down on a plate few minutes before eating. Can be eaten lukewarm or cold with toppings of your choice. Freezing: freeze well in airtight container. Make sure the shells don't overlap or it make them difficult to defrost individually. Place a piece of parchment paper between each taco to avoid this problem. Defrost in less than 1 hour at room temperature. Rewarm in sandwich wrap or hot oven 1-2 minutes at 150 C (300f). Nutrition panel is for one taco shell using almond flour. This recipe makes 4 taco shells. Hi Elaine, I am pretty sure a mix of almond meal and psyllium would make the deal. I would try to substitute the amount of oat flour by 3/4 amount of almond meal for 1/4 amount of psyllium husk! Then, just add more psyllium husk if it is too runny. It will absorb the extra moisture and makes things goes together. Hope it works cause this is delicious! See you sson on the blog Elaine! Carine. The recipe is not using bran but almond meal or oat flour – it is basically rolled oat ground into a powder. I never used kale in this recipe but I am pretty sure it will work. Make sure you chop it finely, specially if it is curly kale, it is a stronger veggie and it won’t combine as well in the batter if the pieces are too big. I would love to grow some kale too but I don’t have any more space in my garden this year ! Also, if you want to use your kale you can try my kale pizza crust or kale egg free frittata or cashew kale pesto. Thanks for reading the blog. XOXO Carine. What can I use if I don’t have almond or oat bran? I’ve got coconut flour and spelt flour. Hi Mélissa, unfortunately those ingredients are the main ingredients of those spinachanges tacos. As I never tried spelt and coconut flour in this recipe I can’t advice on how to make this recipe with those flour. See you soon on the blog, carine. Carrie, I’m excited to find this spinach soft taco recipe. We have fresh spinach in the garden so I will try it soon. As a post-bariatric surgery patient, I am always looking for recipes that are low-carb, high protein and good for me. Thank you for coming up with this recipe. Hi Joyce, I am always so happy to read your comment and to know that my recipes can help in the kitchen. You will absolutely love those spinach tacos even more with your own fresh spinach! Thanks again for the support and lovely comment Joyce! It is always a pleasure to read you. Carine. Hello! I am glad you love the recipe. My 3 years old love it and I am pretty sure your kids will love them too! Enjoy this spinach taco and let me know how it goes! Carine. Hi! This looks really good! Is there anything else I can put in it instead of cheese (and that still stays firm enough to form it and eat it as a taco)? Hi Anita, I agree it is a very good recipe! There is lots of cheese in those tacos so it is difficult to make it dairy free. However I have got a similar recipe using zucchini and no cheese – arrowroot flour and coconut flour instead. If you want a dairy free taco recipe you may prefer that one here 🙂 Enjoy and let me know how it goes xoxo Carine. is it possible to use regular white flour? Hi Emma, I never tried this recipe using white flour as I am only using nourishing and unrefined flour. I guess it will work too but because white flour contains less fibre the texture will be very different probably drier and less like a soft taco. I hope it helps! Enjoy the recipe. Carine. Just made these, following directions using the almond flour option, easy–peasy, looked exactly like the photo. Instead of tacos, I was craving pizza, and becsuse they hold together so well it worked like a charm Topped with homemade tomato sauce and shredded parm-jack blend. Soooo good. Keeping this in my recipe box as a definite repeater. Hi Corinne, I LOVE your comment! What a great idea to make a pizza bse with this zucchini taco recipe 🙂 I hope you find even more delicious low carb recipes on the blog, I also have a great spinach taco and carrot taco shell recipe 🙂 See you soon on the blog! Carine. Hi Julia, Unfortunately this recipe need cheese to hold ingredients together. I would suggest you to try my dairy free zucchini tortilla recipe. I love making this one for my dairy free guest. Recipe is available on the blog here. Enjoy Julia! I winder could you cook it in a skillet instead of baking it in the oven? Hi Jennifer, I am not sure it will work as it may stick to the skillet. Oven is definitely the best way to cook those tortillas. Enjoy Jennifer! Carine. These sound great!!! I wonder if I could put all of the ingredients in a food processor or blender to make the dough? I also wonder if I could use frozen spinach? Hi Carol, yes it is a great easy recipe ! I don’t have great success with frozen spinach it added too much water to the batter – harder to dry out. Also, I guess that it will work if you put everything into the food processor but again the texture will be different. It may remove the spinach bites that gets crunchy while baking. The taco will be softer and more like an omelette I suppose. Let me know if you try anyway 🙂 I am always keen to make my recipes in a different way! Thanks for following the blog. xoxo. Carine. Hate to leave a comment if I made changes. But the base recipe is awesome. They turned out amazing. I used frozen spinach 2 1/2 300g packets, 4 eggs, about 2/3 cup home made gluten free all purpose flour ( found on Pinterest) I just added it till I achieved what I thought was the right consistency, oregano salt and pepper, Cajun seasoning and my favorite. I didn’t have cheese today so I added two tbsp of plain Greek yogurt and 1/4cup of nutritional yeast. It made 8 large taco sized wraps and my dh said they are amazing he said it’s some recipe book quality. Thanks for all your awesome recipes and again sorry for changing your recipe but as a new mom I used what I had on hand. Hi Amanda, what a beautiful comment! you made my day, really 🙂 I love the way you adapted the recipe with no cheese ! I have got so much people asking me for cheese free alternatives and here we are ! You did it ! Thank you VERY much Amanda. I hope you will keep following the blog and share your lovely comments. Just love it and I know how much time it takes to write them! Love from NZ, xoxo Carine. Wow! I have been wanting to make these since you posted this recipe as I am a big fan of spinach too. These were so delicious (and easy!) and got an A+++ from the hubby and 3 year old. I used frozen spinach but am looking forward to using fresh spinach once I plant it this weekend. Hi Nicole! So great to read you this morning! I agree this recipe is amazing and kids absolutely love it each time. I am not good at growing my own vegetables but I reckon fresh spinach are always the best! 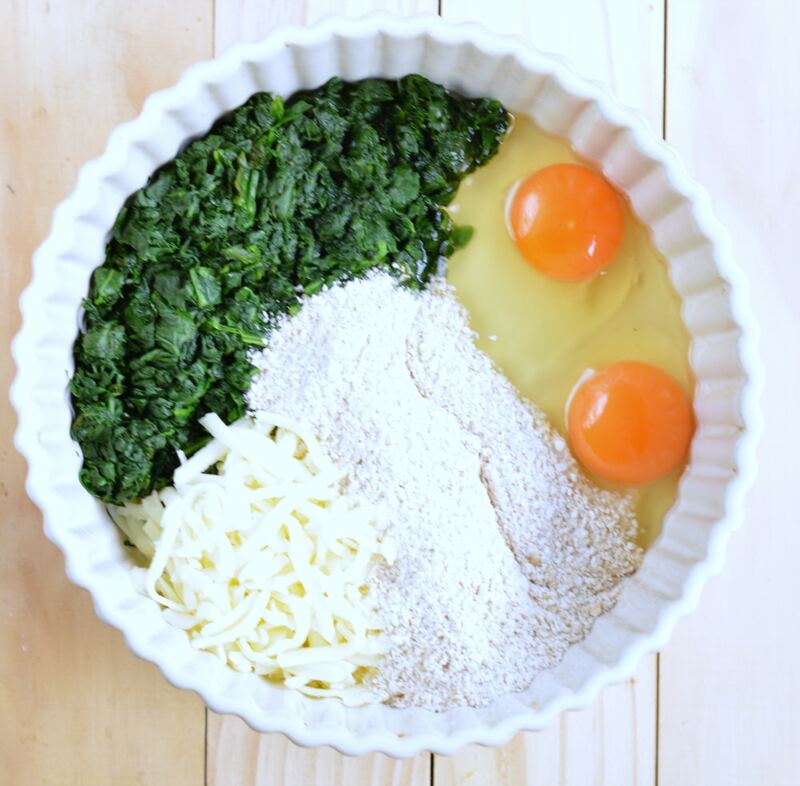 I hope you will find more spinach recipes you love on the blog. I am obsessed with spinach and I keep sharing spinach recipes on the blog. My spinach balls are great for kids too recipe here. Enjoy and see you soon on the blog! Carine. Hi there, I was very excited to see a taco shell without carbs and that is full of magnesium and potassium. I have a rare disease that doesn’t allow me to eat any carbs, sugar, or salt….aaaand I am married to a Hispanic! So that means lots of tacos! I usually just eat the filling, but now I can help my diet with these. I just made these and I don’t think I put enough spinach in mine. I think the 4 oz is after the spinach is cooked. Am I correct? I will have to measure 8 oz raw before cooking down next time. The end resulted in baking longer in the oven because they were too runny. Thanks again! Hi Tami, I am so happy you enjoyed this recipe. As you can see on my video the batter is only slightly runny. You must use 4oz of cooked spinach, drained to create a soft taco shell that bake very well. I am sure you will get there next time. Let me know ! Happy New Year from New Zealand ! Carine. These are the best ever!! I just made these for tonight and I probably shouldn’t have used a 2% cheese (all I had) since the lighter cheese made them bubble a bit. I ended up adding about half a tablespoon more of the oat bran to get the batter to be a bit firmer. I thought I had drained the spinach well, but after it sat about 3 minutes, I saw I didn’t. Next time I think I’ll do what I do for spinach dip (squeeze the heck out of it with paper towels and then refrigerate it for 20 minutes to see if it is thoroughly drained.. I baked at 375 for 15 minutes because my oven loves to burn things. (g) We like these tasty shells, but think that heavy seasoned Mexican dishes really over power the shells taste wise. Next time we’ll try them with sautéed vegetables for a “breakfast taco” or use as salad holders. Thanks for the unique recipe! Hi Stacia, As you can see on the recipe video I do squeeze out all the spinach juice with my hands first and then pat dry the spinach between sheets of absorbent paper. It is crucial in this recipe to remove all the extra moisture or -as you said- the batter will bubble or not hold well together. I am pretty sure that low fat cheese won’t be an issue if you remove all the extra spinach moisture first. I am happy that you enjoy the recipe. Let me know how it goes next time. Thanks for reading the blog. Carine. How do I measure 2 litre of boiling water and what cheese did you use and is it baby spinach? Hi Kris, 2 litre of boiling water can be measured as 16 cups of boiling water. Baby spinach leaves are tiny spinach leaves that you can buy in any supermarket usually in vacuum bag in the salad aisle. You can use any shredded cheese in this recipe I love edam, cheddar or colby. Enjoy the tacos ! Carine. I made them for dinner and they were very good, will make again! Hi Diane, I am so glad you love those spinach taco! Thanks for trying my recipes and coming back on the blog. It is such a pleasure to be read and to share my recipes from my kitchen to yours <3 xoxo Carine. ANy idea if nutritional yeast can be used in place of the cheese? No I am sorry, cheese is really needed in this recipe to hold the spinach together. if you are looking for an easy 4 ingredients vegan tortilla similar to those spinach tacos, I recommend to try my zucchini tortillas. It is working perfectly with a chia egg. Have a look here. XOXO Carine. Smelled great, cooked great but could not get them off the parchment paper and ruined the whole batch, what did I do wrong? Hi Kerrie, this is clearly an issue with your baking paper. What you can do is spray sme oil on the paper with out baking the tortillas and it won’t happen again 🙂 Enjoy the recipe ! Carine. Made them with almond flour and filled them with ground meat and tomatoes. Next time I’ll try bake them on a silicone baking mat since these got stick onto the parchment paper (even though I had previously spread some butter on it to prevent it!…). Merci beaucoup Carine pour une autre magnifique recette! ? Just tried the spinach toco recipe and it is awesome. My daughter and granddaughter are on low carb diets now and they love it. You are right about getting all the water out of the spinach before mixing in the other ingredients. Thank you again, keep the recipes coming. Thanks for sharing this lovely comment! I am so glad you love them. Enjoy the low recipes on the blog. XOXO Carine. I am making your Spinach Taco Today. I will give feed back when I accomplish your recipe. Im excited. Awesome ! enjoy them, XOXO Carine. Amazing ! I am so glad you love them 🙂 Enjoy the low carb recipes on the blog. XOXO Carine. Just made them … soooo delicious thank you. For next time Do you think I can freeze them and use later in the week again? Amazing news! Thanks for reporting your positive experience in the kitchen. I am sure they freeze well too. Make sure you bake them before freezing, place a piece of parchment paper between each shells to avoid them to stick together. It should defrost super fast as it is thin less than an hour and rewarm super well 2-3 minutes in a hot oven at 150C. Enjoy XOXO Carine. Made these today. They are crazy delicious. I ate all four, two for breakfast and two for lunch. I would like to double the recipe. Have you done this? Are any adjustments needed? Thanks! Awesome ! You can safely double up the recipe without changing anything 🙂 Enjoy the tacos. XOXO Carine. Thanks for the lovely comment and for trying my taco shell recipe. I am so happy you love it ! Enjoy the blog recipes. XOXO Carine. Hi, I’d like to make these however I’m seeing both almond meal and almond flour referred to in the comments. Could you please confirm which is it? Thank you! Can’t wait to make this! Almond flour and almond meal are basically the same thing. Almond flour tend to be thinner but in my recipe it never makes difference that is why I use both names. I am sorry if this was confusing for you. Enjoy the taco shells. XOXO Carine. Hi, Carine. Just wanted to let you know that this recipe is absolutely FABULOUS! Both me and my husband are only 1 year into low carb eating (not fully keto though) and this recipe has become a staple in our house. I make it once a week, on a regular basis. My husband only had the chance to eat it today and he was impressed (he’s a chef mind you, quite difficult to impress, and he liked it very very much). All your recipes are awesome, I am also regularly doing the coconut wraps and the keto buns. Oh thank you !!! You made my day. Enjoy the low carb recipes on the blog, XOXO Carine.